Before you can get into the exciting world of the Riven easter eggs you have to go through the game in an excact sequence in order to unlock them. Back in the days, if you would have liked to reveal these unlocking spots yourself, you could have visited the "Unofficial Riven Homepage" for some hints on how to get through cho.cyan.com (The link back then was http://members.aol.com/mystsequel/), but the site that once was the web site to go to for Riven News has unfortunately closed down. Five different so-called "hidden" spots are lying around the game for you to click on - actually there are more than five, but some of them are the actual easter eggs themselves. The trick is to click these spots in sequence, and now a warning: You have to click each spot only once! I've tried a couple of times to click the individual spots several times, and I don't know if it's my version of the game, but it hasn't worked for me that way, so remember, just in case - click only once on each spot! You can tell when you've hit a secret spot by seing your cursor disappear after clicking on it. 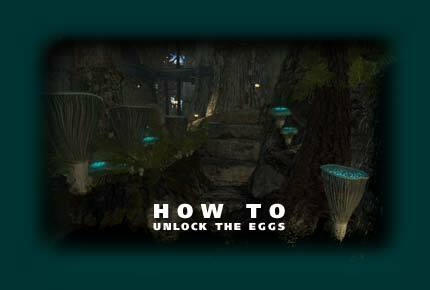 In August 2017, Joseph Grabko reached out to me and told me that there is an easier way to unlock the eggs. I haven't been able to test this myself, but it seems rather legitimate. It is by utilising the mysterious spots in the game that you can read about here. So if you feel like 'cheating' a bit, you could try this instead. Cathy Miller wrote to me and asked me if the eggs were to be found in the Sony Playstation version of Riven, and I passed the question on to Cyan. Richard A Watson (Rawa) replied that the eggs indeed are in this version of the game, but the cursor do not disappear when you click on the hidden spots! Furthermore, the low resolution and refresh rates on televisions make it difficult to activate the last hidden spot, unles you know excactly where to point and klick - so take a close look at the picture on this page so you'll know where to find it.